1. 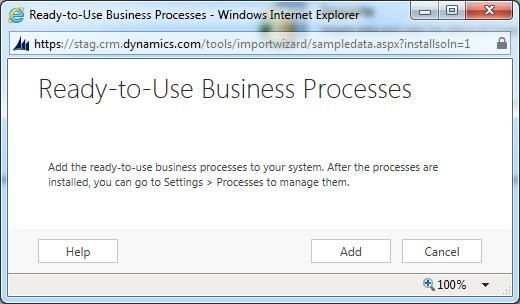 On the navigation bar, click or tap Microsoft Dynamics CRM -> Settings. 2. Click or tap Settings -> Data Management. 3. 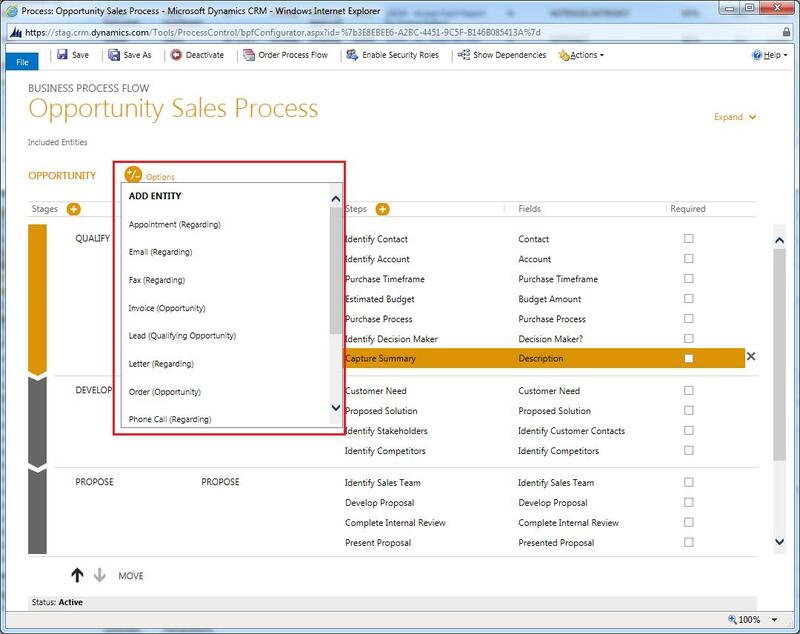 Click or tap Add Ready-to-Use Business Processes. 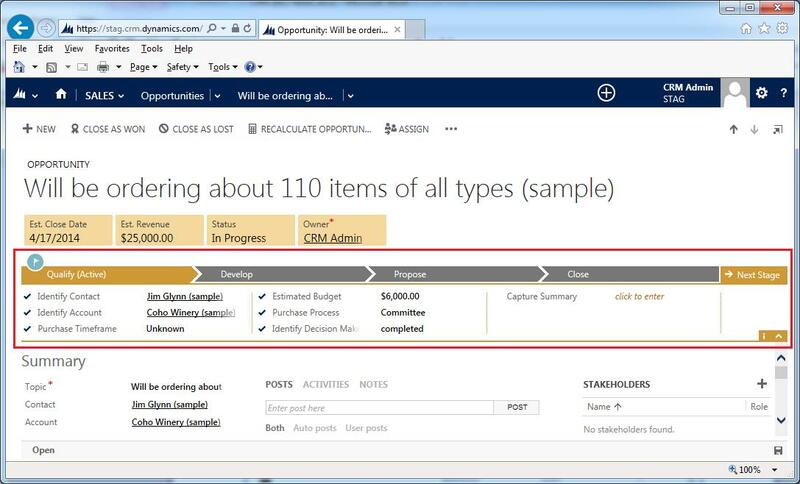 Ready-to-use business processes flows are activated automatically when you add them. If a ready-to-use business process includes workflows or portable business logic rules, you’ll need to activate those separately. The following table shows a list of ready-to-use business processes and what they help you do. 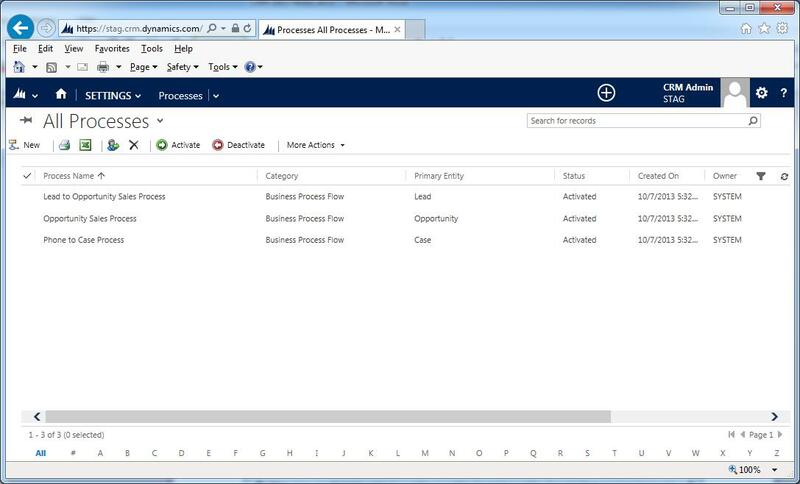 Below screenshots shows list of ready-to-use business processes after installing. Contact to Order B2C – Fill Ship To fields WF Workflow A synchronous workflow that defaults the Ship To and Address fields on the Order form once the order is created. In store excellence – create visit WF Workflow A synchronous workflow process that creates a store visit once the Order Priority is set to Default Value. Opportunity to Invoice B2B – OrderToInvoice WF Workflow A synchronous workflow process that updates the Bill To fields on the new Invoice form. Opportunity to Invoice B2B – QuoteToOrder WF Workflow A synchronous workflow process that updates the Ship To fields on the Order form based on quote values. Opportunity to Invoice B2B – OptyToQuote WF Workflow A synchronous workflow process that updates the Description and Ship To fields on the Quote form based on opportunity values. Upsell after service interaction – create upsell task WF Workflow Create an upsell task if the customer experience is good. For an unsatisfactory customer experience, a follow-up customer activity is also created. Contact to order (Business-to-Business) Business Process Flow Target sales by using a consistent method to interact with customers. Email sales campaign Business Process Flow Email prospects, create and qualify leads, develop opportunities, and then close deals. Guided service case Business Process Flow Make sure that data is entered consistently for service cases, and that required activities are completed to resolve a case. Phone sales campaign Business Process Flow Call prospects, create and qualify leads, develop opportunities, and then close deals. Service appointment scheduling Business Process Flow Schedule service appointments, set up reminders, and make sure service activities are completed. Marketing list builder Business Process Flow Create targeted marketing lists for accounts, contacts, or leads, add prospects, and gain manager approval. Opportunity to invoice (Business-to-Business) Business Process Flow Follow a standard process for assessing needs, negotiating outcomes, fulfilling orders, and closing opportunities when selling to other businesses. Service case upsell Business Process Flow Upsell additional products or services while resolving a customer’s service request. Multichannel sales campaign Business Process Flow Contact prospects by phone and email, create and qualify leads, and then close deals. Upsell after service interaction Business Process Flow Turn a good service experience into an opportunity to upsell more products and services to the customer. 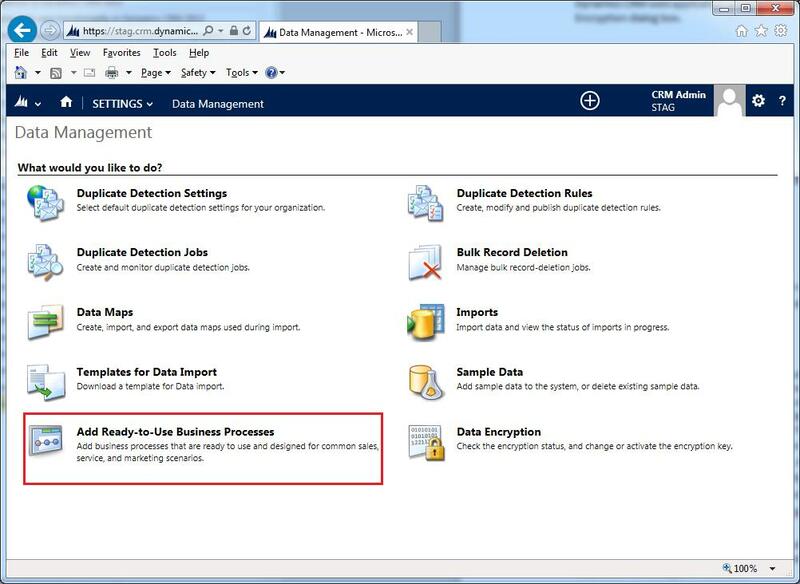 Delete Ready-to-use Business Processes: Follow below steps to delete all ready-to-use business processes from the system. 2. Click or tap Settings -> Solutions. 3. 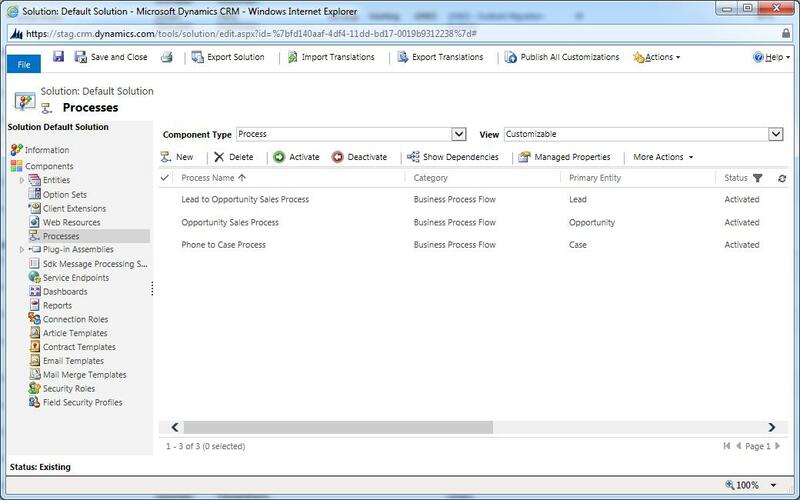 Select the ‘BusinessProcesses’ solution and click on ‘Delete’ command to remove all Ready-to-use Business Processes. 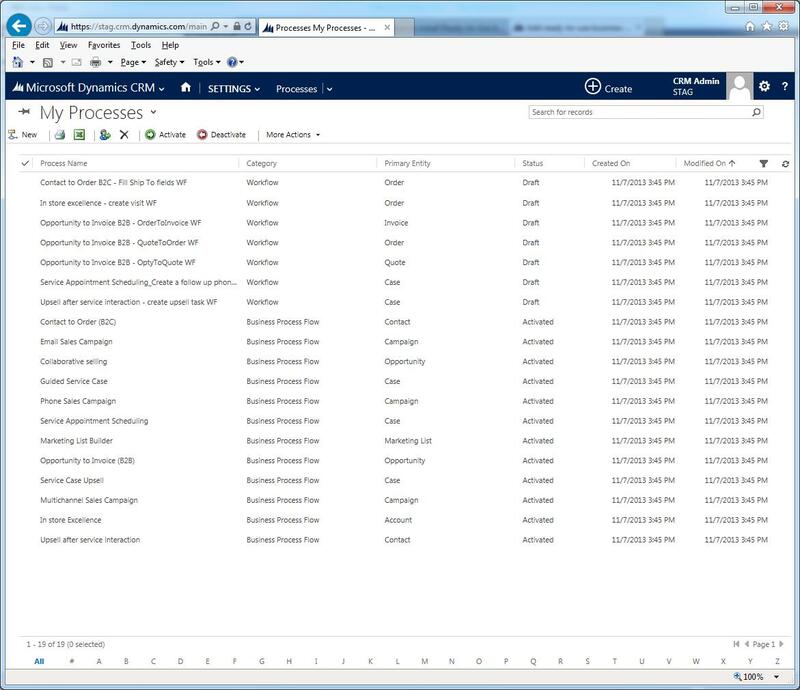 Business process flows are a new feature in Microsoft Dynamics CRM 2013. Business process flows use the same underlying technology as other processes, but the capabilities that they provide are very different from other features that use processes. 1. Why use business process flows? Business process flows provide a guide for people to get work done. They provide a streamlined user experience that leads people through the processes their organization has defined for interactions that need to be advanced to a conclusion of some kind. This user experience can be tailored so that people with different security roles can have an experience that best suites the work they do by using Microsoft Dynamics CRM 2013 and Microsoft Dynamics CRM Online. 2. What can business process flows do? Business process flows integrated with other customizations: When you or your user enters data using business process flows, the data changes are also applied to form fields so that any automation provided by business rules or form scripts can be applied immediately. Steps can be added that set values for fields that are not present in the form and these fields will be added to the Xrm.Page object model used for form scripts. Any workflows that are initiated by changes to fields included in a business process flow will be applied when the data in the form is saved. If the automation is applied by a real-time workflow, the changes will be immediately visible to the user when the data in the form is refreshed after the record is saved. 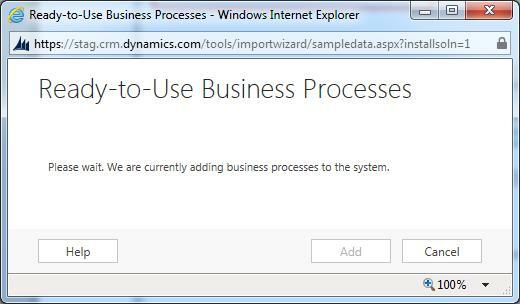 These business process flows are provided so that people who are using Microsoft Dynamics CRM Online and who used the processes that were released with the Microsoft Dynamics CRM December 2012 Service Update will be able to upgrade and continue to use those processes. 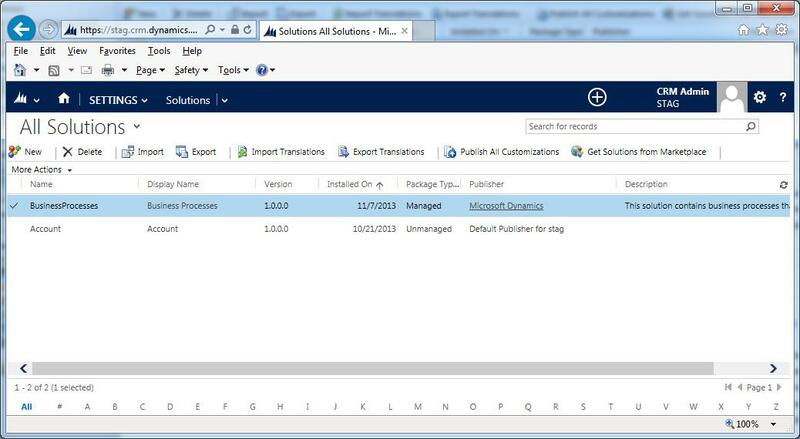 The processes included in the Microsoft Dynamics CRM December 2012 Service Update were hard-coded and included some capabilities that are not found in the business process flows you can create. You can design business process flows that tie together the records for up to five different entities into a single process so that people using Microsoft CRM can focus on the flow of their process rather than on which entity they are working in. They can more easily navigate between related entity records. Control which business process flow will be applied: You can associate business process flows with security roles so that only people with those security roles can see or use them. You can also set the order of the business process flows so that you can control which business process flow will be set by default. This works in the same way that multiple forms for an entity are defined. When someone creates a new entity record, the list of available activated business process flows is compared to the business processes flows that the person’s security role will show them. The first activated business process flow in that list is the one that will be applied by default. If more than one active business process flow is available, people can chose Switch Process from the command bar to apply a different process. Whenever someone switches processes, the current process stage will be set to the first stage of the newly applied business process flow. Each record can have only one business process flow at a time. When any user applies a different process, that process is the one that the next user to view the record will see. If someone’s security roles do not allow them to use a specific business process flow, the current business process flow will be visible, but disabled. To enable a custom entity for business process flows, select the Business process flows (fields will be created) check box in the Entity definition. Business process flows use the same technology as other types of processes. The process to create them is similar, but configuring them is very different. Process name: The name of the process does not need to be unique, but it should be meaningful for people who need to choose a process. You can change this later. Category: This property establishes that this is a business process flow process. You can’t change this after you save the process. Entity: Choose one of the entities from the list of business process–enabled entities. 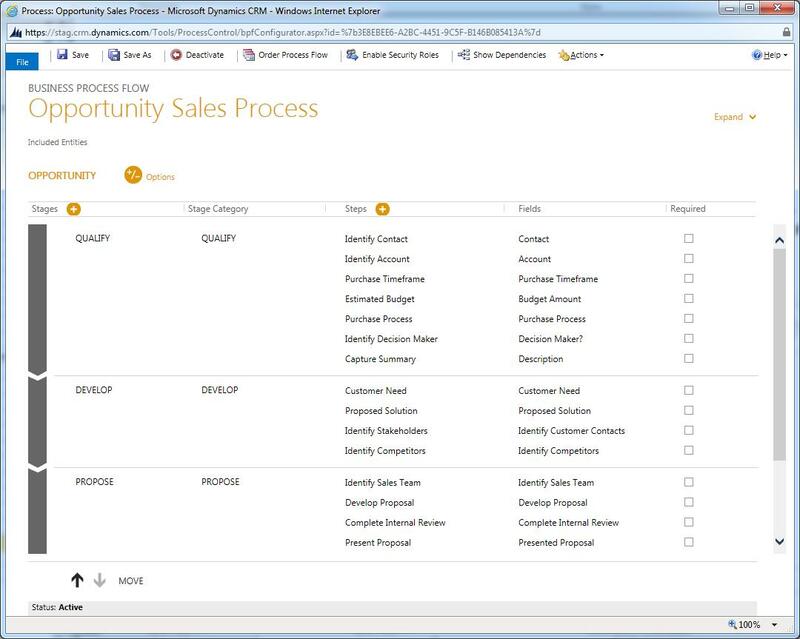 If you don’t find the entity you expect, make sure the entity has the Business process flows (fields will be created) option set in the entity definition. You can’t change this after you save the process. Note: Business process flows have a simplified way to reuse existing business process flows as an advanced starting point for new business process flows. When you select Business Process Flow as the Category, there is no option available to set the Type value as you can for other types of processes. Instead, when you open an existing business process flow, you will find a Save As button on the command bar. This will create a new business process flow that is the same as the existing one, except that the text (Copy) will be appended to the name. After you create a new business process flow, the Create Process dialog box will close and you must find the new process in the list and open it. If you want to rename the process or add a description, you must click or tap the Expand toggle to view these properties. When you define the logic for a business process flow, you will edit stages and steps, and add additional entities. Edit Stages: Business process flows can have up to 30 stages. To add a stage, click or tap the (+) icon near the Stages column. To remove a stage, select it and click or tap the X icon on the right edge of the stage. Stages have a label that you can set. The text of the label is always in upper case. Stages also have a Stage Category. This is optional. Stage category is useful for reports that will group records by the stage they are in. The options for the stage category come from the Stage Category global option set. You can add additional options to this global option set and change the labels of existing options if you want. You can also delete these options if you wish, but we recommend that you keep the existing options. You won’t be able to add the exact same option back if you delete it. If you don’t want them to be used, change the label to ”Do not use”. Edit Steps: When you have selected a stage, click or tap the (+) icon near the Steps column to create a new step. To remove a step, select it and click or tap the X icon on the right edge of the step. Each step has a label set to New Step when you create it. When you set the field for the step, if you haven’t edited the label, the label for the step will change to match the label for the field. Generally, you want the label for the step to match the label for the field. Once you edit the label, it will not change when you change the field. You can add any of the entities that have one-to-many relationships with the entity selected for the process. After you add an entity, you can select any of the entities that have a one-to-many relationship with that entity. You can add up to five entities, but each entity you add can only proceed to one of the entities that have a one-to-many relationship with the previous entity. If an entity doesn’t have any one-to-many relationships, your only option is to close the process cycle. Closing the process cycle is always the last stage of the flow. You can close the cycle by using any of the entities in the cycle. This is frequently a step to change the state of the original entity, but you may choose a different entity. Remove Additional entities: After you have added an additional entity in Options, you will see a new Deleted Last Entity option. Because each entity you add depends on the previous entity, when there are multiple entities, you need to remove them in the reverse order in which they were added. To make a business process flow available for people to use, you must order the process flow, enable security roles, and activate it. Set Order: When you have more than one business process flow for an entity, you need to rank the order in which they should be evaluated to be used by default. 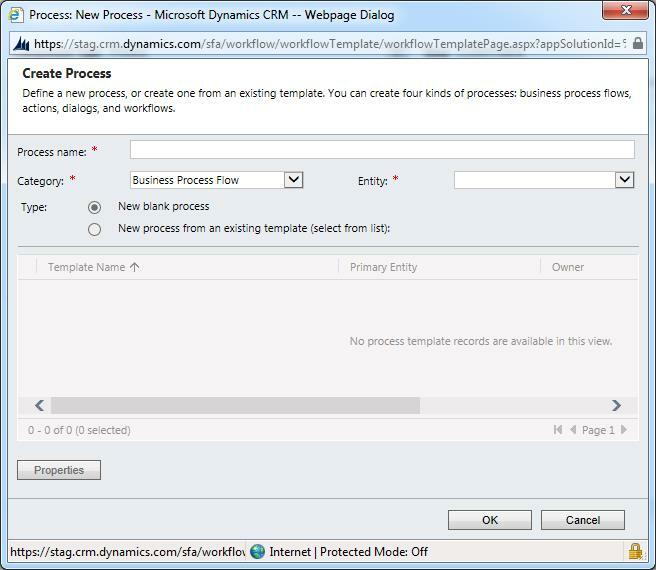 To open a dialog where you can move business process flows up or down, in the command bar, select Order Process Flow. For new records or records that do not already have a process flow associated with them, the first business process flow that a user has access to is the one that will be used. Enable Security Roles: People will only be able to use business process flows that are associated to security roles that are associated with someone’s user account. By default, only the System Administrator and System Customizer security roles can view a new business process flow. To set these roles, in the command bar, select Enable Security Roles. You can choose either the Enable for Everyone or Enable only for the selected security roles options. If you choose Enable only for the selected security roles, you can select which security roles will allow access to the business process flow. Activate: Before anyone can use the business process flow, you must activate it. In the command bar, select Activate to open the Process Activate Confirmation dialog box. After you confirm the activation, the business process flow is ready to use. If a business process flow has errors, you will not be able to activate it until the errors are corrected.